"...not everyone can be a legend, we all have the opportunity and responsibility to leave a godly legacy." 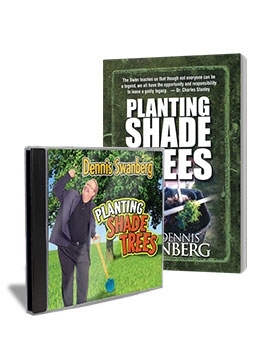 This great package includes both the book "Planting Shade Trees" and the CD "Planting Shade Trees." This means that you'll be able to get an in depth look at the true meaning of legacy while also hearing the stories from Dennis Swanberg, himself. The best shade trees you'll ever plant are the ones you'll never sit under! None of us are self-made. We're all sitting under "shade trees" that our forefathers, families, and friends planted. Now, it's your turn to leave a meaningful legacy by planting your own shade trees for others to sit under. Note everyone can me a legend, but everyone can leave a legacy. "With his extensive knowledge of history, wonderfully insightful stories, and characteristic wit, Dennis teaches us that though not everyone can be a legend, we all have the opportunity and responsibility to leave a godly legacy."